EA Sports FIFA franchise is also know by having amazing soundtracks. Which songs you would love to see included in the game? 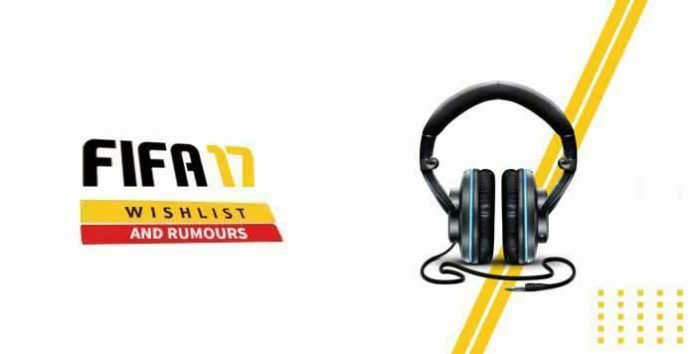 Share your FIFA 17 soundtrack wishlist with us. This is the time of the year in which everyone has an opinion. Everyone dreams with the perfect FIFA. Let see what the community wants. Share with us in the comments your FIFA 17 soundtrack wishlist. There are many FIFA 17 rumours, but most of them are fake. We picked the most reliable rumours, added our perception and share our opinion with you about the most likely FIFA 17 songs. This was the first song of the FIFA 17 soundtrack to be officially confirmed. Paper Route is an American indie rock band from Nashville, Tennessee formed in 2004. It consists of JT Daly (vocals, keyboards, percussion), Chad Howat (bass, piano, programming), and Nick Aranda (guitars). The band has released two full-length albums and several EPs. If ‘Chariots’ was the first song to be officially confirmed, Zedd was the first artist. Until now, we still don’t know which song will be part of the soundtrack but the ones with biggest chances are ‘True Colors’ and ‘Beautiful Now’. Zedd is a Russian-German Grammy Award winning musician who created one of the custom kits of FIFA 17. This song was associated with the FIFA 17 soundtrack because it features in the trailer of Juventus and EA Sports partnership. Ian Kamau is a Canadian hip hop and spoken word artist, writer and visual artist from Toronto. This song was associated with the FIFA 17 soundtrack because it features in the trailer of the cover vote. Dizzee Rascal is an English rapper best known for his number-one hits “Dance wiv Me”, “Bonkers”, “Holiday”, “Dirtee Disco”, and “Shout”. Calvin Harris is a Scottish DJ famous by his song “I’m Not Alone”, which became his first number one on the UK Singles Chart. And you? What is your FIFA 17 soundtrack wishlist ? Share your thoughts with us in the comments. Peter Bjorn and John – What You Talking About?